Mother is playing with her baby daughter outdoors. Slow Motion 240 fps. 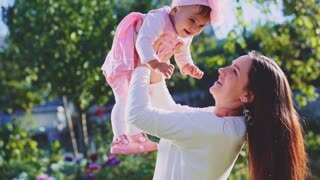 Young mom and her cute little baby-girl are having fun in the sunny garden. Happy childhood and motherhood concept.